Due to the constant temptation to check their smartphones, today’s students are spending less time focused on their schoolwork, taking longer to complete assignments, and feeling more stressed in the process. Just how big of a problem is digital distraction, and how can educators respond? For more than three decades, I’ve studied the psychological effects associated with the introduction of new digital technologies. Over that time, my research team and I have watched Americans move from an initial fear of computers to a state of wary acceptance to eager adaptation to what has become more or less an obsession with the tiny devices we now carry in our purses and pockets. Typically, college students unlock their phones 50 times a day, using them for close to 4½ hours out of every 24-hour cycle. Put another way, they check their phones every 15 minutes — all day long (and sometimes all night) — and they look at them for about five minutes each time. Teenagers are almost always attempting to multitask, even when they know full well that they cannot do so effectively. When teenagers have their phones taken away, they become highly anxious (and visibly agitated within just a few minutes). The average adolescent or young adult finds it difficult to study for 15 minutes at a time; when forced to do so, they will spend at least five of those minutes in a state of distraction. 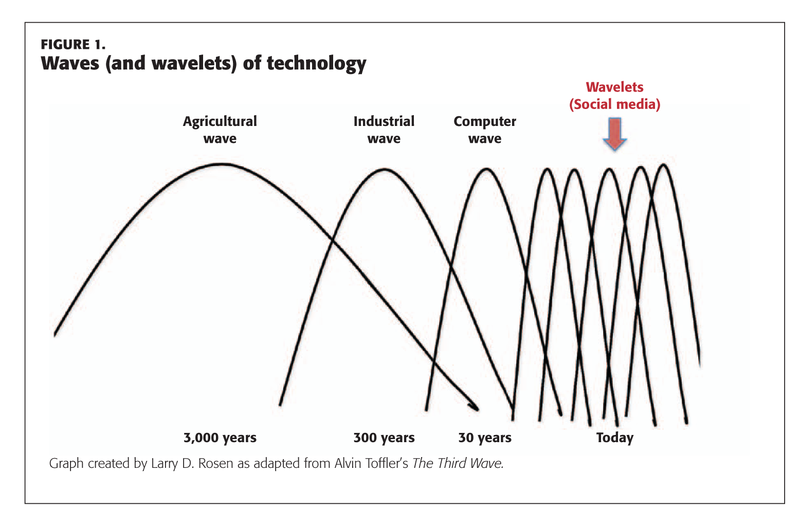 In 1980, the renowned futurist Alvin Toffler observed that new technologies have rolled in like a series of overlapping “waves,” each moving at a much greater speed than the previous one: First came a 3,000-year wave of agricultural technologies; then came a 300-year wave of industrial technologies; then (at the time of his writing) came a wave of computer technologies, which he expected to last for about 30 years before some other wave would come along, lasting for perhaps as little as three years if the trend continued (Toffler, 1981, 1990). At this point, new technologies rise and fall so quickly that it hardly seems right to describe them as waves at all — more appropriate to call them wavelets — though each one has the power to change our lives in profound ways: The web put the world at our fingertips and allowed us to connect with people anywhere in the world; social media spawned dozens of web-based communication systems; and the smartphone (which really “changed everything,” said Steve Jobs) put a computer, a TV, a music player, and the entire web into our pockets. Coming next could be multiple wavelets of implantable technology, featuring devices that monitor, assess, and assist our biological functions. The question is, what does this increasingly rapid influx of media and technologies do to us mentally, physically, and neurologically? More specifically — and as the neuroscientist Adam Gazzaley and I have recently explored in our book The Distracted Mind: Ancient Brains in a High-Tech World — as young people are buffeted by one new communications technology after another, what happens to their ability to focus on the present? (Gazzaley & Rosen, 2016). All three groups performed equally well on the test. However, the second group took longer than the first to complete the reading and the test, and the third group took the longest of all. Further, the third group reported experiencing significantly greater amounts of stress — no surprise, given that every time they tried to focus on what they were reading, they were interrupted (Bowman et al., 2010). In another study — led by Gloria Mark at the University of California, Irvine — researchers observed office workers over three eight-hour days. They found that, on average, the workers were interrupted (or interrupted themselves) every three to five minutes, and it often took them as much as 20 minutes to return to their work. Half of the interruptions came from communication alerts (texts, phone calls, IMs, and notifications). To make up for constant interruptions, employees were forced to work faster, which led to greater stress (González & Mark, 2004). In 2013, and building on Mark’s research, my colleagues and I conducted a study in which we asked 279 middle school, high school, and college students to study “something very important” for just 15 minutes in their natural studying environment. Trained observers recorded students’ actions closely, taking minute-by-minute notes on whether they were, in fact, immersed in studying, as well as taking notes on the various technologies present, the number and kinds of windows open on the students’ computer screens, and other features of the students’ chosen study areas. We found that students (regardless of their level in school) spent, on average, just 9.65 of the 15 minutes actually studying, and their behavior tended to follow a distinct pattern: study for a few minutes and then get distracted, over and over again. (See Figure 2.) When students were visibly off-task, a communication-based activity had distracted them more than half of the time (56%). Students who were off-task the most tended to have the greatest numbers of portable devices in their study areas and to have more windows open on their computers. Further, those who visited Facebook one or more times during the observation tended to have lower GPAs than those who refrained (Rosen, Carrier, & Cheever, 2013). In 2016, we replicated this study (this time asking students to record their own behavior) and got the same results, finding the typical student to be distracted for at least five out of every 15 minutes they set aside to study. Only this time, just a few years later, we found that when students were off-task, their attention was absorbed by communication technologies (particularly texting and social media) more than three-fourths of the time. Recently, we also conducted a pair of studies in which we asked college students to install a smartphone app that monitored their daily use. In 2016, students unlocked their phones about 60 times a day and used them for a total of 220 minutes. One year later, a comparable group unlocked their phones only 50 times a day, but they used them more, totaling 262 minutes per day (or an average of more than five minutes every time they unlocked their phones, up from four minutes the previous year). As part of this research, we also monitored students’ daily technology use in general, as well as their attitudes and opinions about their technology use. We found that in the single year between our studies, students’ use of social media increased significantly, as did their media sharing and their anxiety about keeping up and checking in with others in their social networks (sometimes referred to as FOMO or fear of missing out). According to our 2017 data, the typical student has an active account on six of the top 10 social media sites and actively engages with each of them several times a day. No wonder they are so distracted. It must be exhausting to keep up with all that social media. My colleague Nancy Cheever’s research provides further insights into the kind and intensity of anxiety associated with social media. 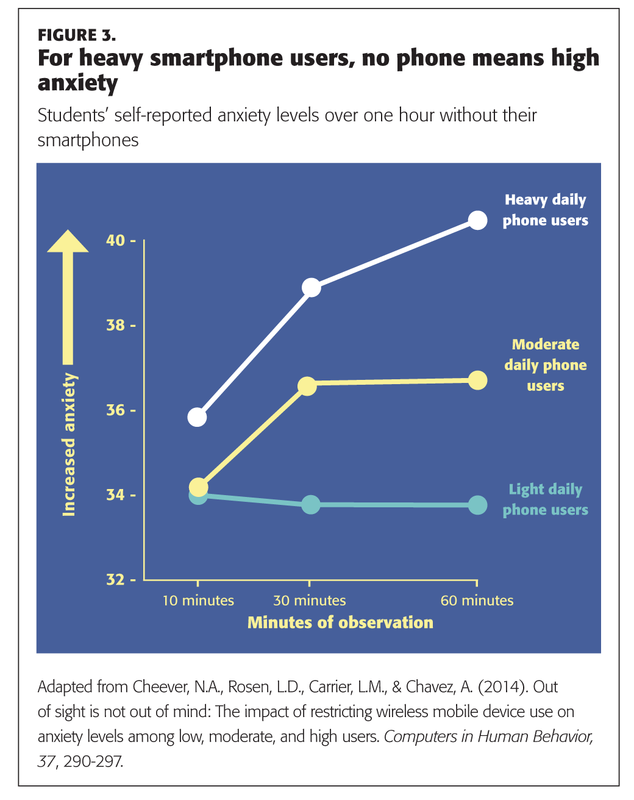 Having performed a range of studies on smartphone use and its psychological effects, my colleagues and I have concluded that phone-related anxiety — often referred to as FOMO — is a major predictor of both poor performance in school and sleep deprivation. I find the latter to be especially worrisome. In one study (Rosen et al., 2016), we found that most students used their smartphones right up to the minute when they closed their eyes and attempted to fall asleep. 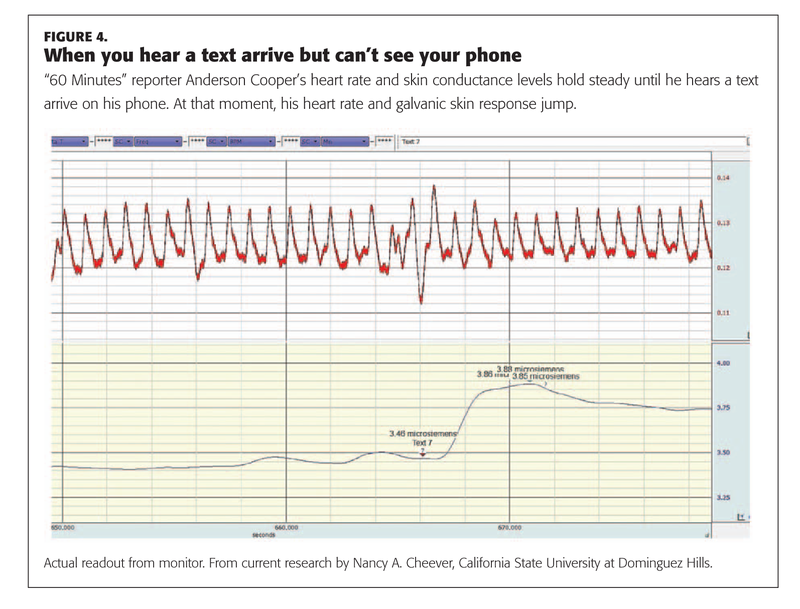 Three-quarters of students slept with their phones on (or set to vibrate) and close at hand (often in hand). Roughly half of them checked their phones in the middle of the night (for reasons other than to check the time; social media was the main culprit). This is a huge problem, given that sleep plays an absolutely critical role in learning, allowing us to consolidate important information, rid ourselves of unwanted information, and dispose of stray toxic molecules left in the brain during the day. The human body includes hormonal mechanisms that ensure that it gets the sleep it needs — as day turns to dusk, the pineal gland starts to secrete melatonin, which is a hormone that gradually makes people sleepy. However, most electronic devices emit light in the blue part of that spectrum, which tells the pineal gland to shut down the melatonin and orders the adrenal gland to secrete cortisol, which wakes people up. The closer one holds the device to one’s eyes, the more blue light is absorbed and the more difficult it is to get a good night’s sleep. The upshot is that 80% of today’s teens say they rarely or never sleep well. The National Sleep Foundation recommends nine hours per night, but most teens now get far less than that. Most weeks, they accrue 12 hours of sleep debt, which can only be repaid by sleeping during the day (often in class). Young children should spend no more than 30 minutes at a time using interactive technologies, followed by a break of at least an equivalent amount of time, or more when possible. As they reach preteen and adolescent years, they should spend no more than 90 minutes at a time with technology, followed by at least 10 to 15 minutes of some activity that neuroscientists have shown to calm the brain, such as going outside in nature, exercising, listening to music, meditating, taking a hot bath or shower, talking to a friend in person, playing a musical instrument, or practicing a foreign language. Ten to 15 minutes should be sufficient to reset the brain. #2. Help students build stamina for studying with tech breaks. If they’ve become habituated to constant smartphone use, students may need to relearn how to focus for periods of time without interruptions. I recommend treating this like any other kind of strength training: Start off easy, and then build stamina. For example, imagine that a student is sitting down to study with a phone by her elbow. Ask her to take a minute to shut down any web sites and apps that are irrelevant to what she’s studying. (Don’t just minimize those apps, since they might buzz with alerts and notifications, creating an anxious need for her to check in.) Have her set an alarm for 15 minutes, silence the phone, turn it upside down, and put it within sight — this should keep her from becoming anxious, since 15 minutes is not long to wait. When the alarm rings, allow her one minute to check her messages and social media, and then repeat the process. When she’s comfortable leaving the phone alone for 15 minutes (which you’ll know because when the alarm rings, instead of racing to check the phone, she’ll wait until she has finished the paragraph she’s reading or the math problem she’s trying to solve), then set the alarm for 20 minutes between check-in times, then 25 minutes, and so on. Suggest that she tell her friends she will be checking in less frequently, so that they know not to keep texting her if she doesn’t respond immediately. #3. Advise students to treat sleep as sacred. The National Sleep Foundation urges people not to engage in any active technology use in the hour before bedtime. The Mayo Clinic is a bit more lenient, recommending that LED-based technology should be placed no closer than 14 inches from one’s face and the brightness dimmed — and both iPhones and Android phones include a setting that gradually changes the light from blue to pink at night. Recommendations for the hour before going to bed include: reading a paper book (paper reflects light in the warm spectrum, which continues the secretion of melatonin! ); watching a favorite TV show, preferably a repeat since this requires less mental processing than a new show; or listening to a playlist of favorite songs, preferably ones that you can “sing in your sleep” since that requires much less mental effort than listening to new music. #4. Tell students to minimize the alerts and notifications. It may not even occur to students that they can turn off the alerts and notifications on their phones. But, if they can be persuaded to shut them down, that will reduce some of the stimuli that appear on their screens and beckon them to tap and click, almost without conscious effort. (Personally, at the end of the day, when I flick away all my open apps, I am always shocked to see how many of them I opened during the day. Most of them I don’t even recall using.) It also can be helpful to suggest to students that they move their apps into separate folders so that fewer icons will catch their eye when they unlock their phones — the fewer apps they can see on their home screens, the fewer of those rabbit holes they’re likely to dive into. #5. Advise parents to create specific tech-free zones. This can include the dinner table, a restaurant, the car, the family den, or the bedroom (though this may require weaning the student from the habit of studying in bed, surrounded by devices). At first, teenagers may need to be given a one-minute break (midway through a meal, a drive, or whatever the activity may be) to check their phones and quell the anxiety that they are missing out on something happening on social media. I am often asked if we have reached a saturation point in our obsessive consumption of social media and all that our smartphones offer. Sadly, I don’t think we are there yet. Every year it only becomes more common to see people carrying their phone in their hand rather than securing it in their pocket, or to hear people admit that they experience phantom phone vibrations (wrongly sensing that they’re getting a text or a call), or to see people panic when they realize their phone isn’t close by, or to see them checking their phones in movie theaters, restaurants, and concerts. The smartphone is still only 10 years old, and many of us are still falling deeper into our obsessive relationship with these devices. I am hopeful, though, that with conscious effort we can help students strengthen their powers of attention. I’ve heard from many educators who have implemented the strategies described above and have seen students become less distracted by fears of missing the latest text or update. While these strategies require diligence, they are not difficult or complicated. And if you’re skeptical that they can help students, then try them on yourself and your own family first — it shouldn’t take long before you begin to feel better able to control your “humanware” and less like your hardware and software are controlling you. Bowman, L.L., Levine, L.E., Waite, B.M., & Gendron, M. (2010). Can students really multitask? An experimental study of instant messaging while reading. Computers & Education, 54 (4), 927-931. Cheever, N.A., Rosen, L.D., Carrier, L.M., & Chavez, A. (2014). Out of sight is not out of mind: The impact of restricting wireless mobile device use on anxiety levels among low, moderate, and high users. Computers in Human Behavior, 37, 290-297. Gazzaley, A. & Rosen, L.D. (2016). 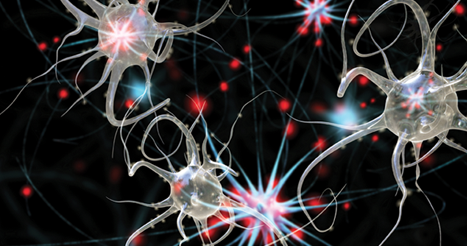 The distracted mind: Ancient brains in a high-tech world. Cambridge, MA: MIT Press. González, V.M. & Mark, G. (2004, April). Constant, constant, multi-tasking craziness: Managing multiple working spheres. In Proceedings of the SIGCHI conference on human factors in computing systems (pp. 113-120). Rosen, L.D., Carrier, L.M., & Cheever, N.A. (2013). Facebook and texting made me do it: Media-induced task-switching while studying. Computers in Human Behavior, 29 (3), 948-958. Rosen, L.D., Carrier, L.M., Miller, A., Rokkum, J., & Ruiz, A. (2016). Sleeping with technology: Cognitive, affective, and technology usage predictors of sleep problems among college students. Sleep Health: Journal of the National Sleep Foundation, 2, 49-56. Rosen, L.D., Lim, A.F., Carrier, L.M., & Cheever, N.A. (2011). An empirical examination of the educational impact of text message-induced task switching in the classroom: Educational implications and strategies to enhance learning, Psicologia Educativa, 17 (2), 163-177. Toffler, A. (1981). The third wave. New York, NY: Bantam Books. Toffler, A. (1990). Future shock. New York, NY: Bantam Books. Citation: Rosen, L.D. (2017). 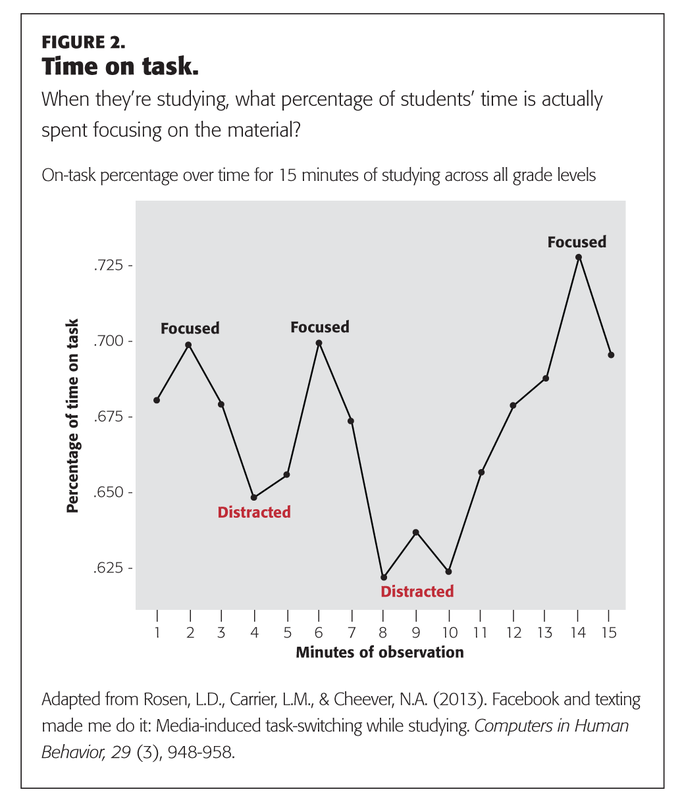 The distracted student mind — enhancing its focus and attention. Phi Delta Kappan 99 (2), 8-14. LARRY D. ROSEN (lrosen@csudh.edu; @drlarryrosen) is professor emeritus and past chair of the psychology department at California State University, Dominguez Hills. His most recent book, coauthored with Adam Gazzaley, is The Distracted Mind: Ancient Brains in a High-Tech World (MIT Press, 2016). A very well written article and it greatly covers the main genres which effect the distraction among students. With the heavy use of cell phones and growing demand for media, not only students but almost everybody is getting distracted these days. For students, it results in Job loss and for others interest in life. Everybody is so consumed in technology that they have almost forgotten what is it to live life actually. Anxiety and Depression are not the results of people losing their interest in life but their increased attachment with smartphones, media, internet and other gadgets. It is very important for students to focus on studies and not get themselves distracted while preparing for the future jobs. Students must know how to balance the use of technology with the education. They must know the positives and negatives of using technology. As distracted minds are good for nothing and a distracted mind does no good except completely destroying your mental abilities to see things as they existed once. A distracted mind could leave you on a road full of pits and holes and would lead you nowhere in the end. So if you want to secure a good job in the future stop distracting yourself and don’t go overboard with the technology. It is important to balance both to have a life free of anxiety. Going outdoors: A natural antidote for attention fatigue?